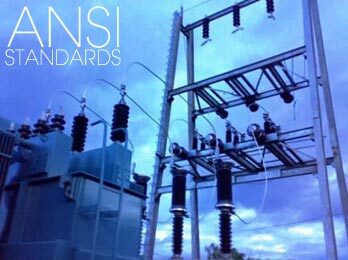 In the design of electrical power systems, the ANSI Standard Device Numbers denote what features a protective device supports (such as a relay or circuit breaker). These types of devices protect electrical systems and components from damage when an unwanted event occurs, such as an electrical fault. ANSI numbers are used to identify the functions of meduim voltage microprocessor devices. ANSI facilitates the development of American National Standards (ANS) by accrediting the procedures of standards developing organizations (SDOs). These groups work cooperatively to develop voluntary national consensus standards. Accreditation by ANSI signifies that the procedures used by the standards body in connection with the development of American National Standards meet the Institute’s essential requirements for openness, balance, consensus and due process. Three-phase protection against overloads and phase-to-phase short-circuits. If a breaker fails to be triggered by a tripping order, as detected by the non-extinction of the fault current, this backup protection sends a tripping order to the upstream or adjacent breakers. Protection against thermal damage caused by overloads on machines (transformers, motors or generators). Automation device used to limit down time after tripping due to transient or semipermanent faults on overhead lines. The recloser orders automatic reclosing of the breaking device after the time delay required to restore the insulation has elapsed. Recloser operation is easy to adapt for different operating modes by parameter setting. Phase-to-phase short-circuit protection, with selective tripping according to fault current direction. It comprises a phase overcurrent function associated with direction detection, and picks up if the phase overcurrent function in the chosen direction (line or busbar) is activated for at least one of the 3 phases. Earth fault protection, with selective tripping according to fault current direction. Directional earth fault protection for impedant, isolated or compensated neutralsystems, based on the projection of measured residual current. Directional overcurrent protection for impedance and solidly earthed systems, based on measured or calculated residual current. It comprises an earth fault function associated with direction detection, and picks up if the earth fault function in the chosen direction (line or busbar) is activated. Directional overcurrent protection for distribution networks in which the neutral earthing system varies according to the operating mode, based on measured residual current. It comprises an earth fault function associated with direction detection (angular sector tripping zone defined by 2 adjustable angles), and picks up if the earth fault function in the chosen direction (line or busbar) is activated. reverse reactive overpower protection for generators which consume reactive power with field loss. Protection of pumps against the consequences of a loss of priming by the detection of motor no-load operation. It is sensitive to a minimum of current in phase 1, remains stable during breaker tripping and may be inhibited by a logic input. excessive motor starting time due to overloads (e.g. conveyor) or insufficient supply voltage. The reacceleration of a motor that is not shut down, indicated by a logic input, may be considered as starting. directly upon starting, before the detection of excessive starting time, with detection of locked rotor by a zero speed detector connected to a logic input, or by the underspeed function. starts too close together in time: motor re-energizing after a shutdown is only allowed after an adjustable waiting time. Phase-to-phase short-circuit protection, for generators. The current tripping set point is voltage-adjusted in order to be sensitive to faults close to the generator which cause voltage drops and lowers the short-circuit current. Protection of transformers against temperature rise and internal faults via logic inputs linked to devices integrated in the transformer. motor and generator: protection of stator windings and bearings. Protection of motors against faulty operation due to insufficient or unbalanced network voltage, and detection of reverse rotation direction. Protection used to check that remanent voltage sustained by rotating machines has been cleared before allowing the busbar supplying the machines to be re-energized, to avoid electrical and mechanical transients. Protection of motors against voltage sags or detection of abnormally low network voltage to trigger automatic load shedding or source transfer. Detection of abnormally high network voltage or checking for sufficient voltage to enable source transfer. Works with phase-to-phase or phase-to-neutral voltage, each voltage being monitored separately. Detection of insulation faults by measuring residual voltage in isolated neutral systems. Protection against phase unbalance resulting from phase inversion, unbalanced supply or distant fault, detected by the measurement of negative sequence voltage. Detection of abnormally high frequency compared to the rated frequency, to monitor power supply quality. Detection of abnormally low frequency compared to the rated frequency, to monitor power supply quality. The protection may be used for overall tripping or load shedding. Protection stability is ensured in the event of the loss of the main source and presence of remanent voltage by a restraint in the event of a continuous decrease of the frequency, which is activated by parameter setting. Protection function used for fast disconnection of a generator or load shedding control. Based on the calculation of the frequency variation, it is insensitive to transient voltage disturbances and therefore more stable than a phase-shift protection function. avoid supplying loads outside the installation. or inhibit shedding following a sudden drop in frequency due to a problem that should not be solved by shedding.